It is around 2.25-mile trail where three miles north of Highway 2 on Clevedon Road. The trail travels eastward down a hill past some old copper mine sites, then climbs a ridge to pass close the Clevedon fire tower. You have to be attention to not climb the fire tower ladder because it isn't legal and dangerous. The trail continues south and loops back to the parking lot. The trail is popular for snowshoeing in the winter months. The Stoney Hill Nature Trail is 1.7-mile. It begins and ends at the Bois Brule Campground. There are some parts of the trail steep, but a rest stop and overlook at the top of Stoney Hill give an enjoyable break, with breathtaking views of the Brule River Valley. As this trail is a designated nature trail, pets are not allowed. 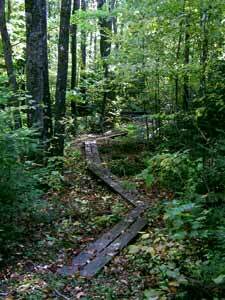 There are more than 40 miles of hunter walking trails crisscross the Brule River State Forest. Casey-Percival Creek is a 14-mile trail near Copper Range Campground, off Clevedon Road, CCC Square Road, and Miller Road. Beaupre Springs is a five-mile trail near Lake St. Croix. Afterhours Road is a 15-mile trail off Highway 2. Hill Top is an eight-mile trail on County Road B near the Winneboujou canoe landing. And, Anderson Road is a three-mile trail near County Road S, off Francis Willard Road, Anderson Road, and Vapa Road. The Afterhours Trail offers great chances during the four seasons. In winter, it is regarded as a well-maintained system of cross-country ski trail for both classical and skate skiing. A trail pass is necessary in the ski season. Afterhours Trail may be used for hiking and biking in spring through fall and hunters may also use these trails. The Brule to St. Croix Portage Trail is part of the National Register of Historic Landmarks. The trail starts at the mark on County Highway A at the north end of Lake St. Croix. Parking is available in the area of St. Croix picnic place. The Native Americans, explorers, traders, trappers, and missionaries used this portage trail as a necessary contact between Lake Superior and the Mississippi River via the Brule and St. Croix Rivers for centuries. When you hike the trail along the upper Brule River among scenic bluff tops and pine flats, you will see many stone markers commemorating previous trail users. The North Country National Scenic Trail passes through the Brule River State Forest. The 16-mile part within the forest offers a true experience to its visitors. Hikers can enter the trail from a trailhead and marker dedicated to U.S. Senator Gaylord Nelson, located eight miles south of Brule along State Highway 27. Visitors can connect the North Country Trail Association for maps and information on the trail in the Brule River State Forest area. The 26-mile Brule-St. Croix Trail links the parking area on State Highway 27 to St. Croix Lake. This trail is open to snowmobiles and ATVs in the winter months and used for hiking, biking, and horseback riding in other seasons. The Connecting trails connect to the trail systems of Bayfield and Douglas counties. Within the Brule River State Forest horseback riders can enjoy miles of trails, Croix Snowmobile Trail, hunter walking trails and numerous back roads. Horses are not allowed in the North Country trail, as it is for foot traffic only. Riders need to locate watering points on a map before starting out or bring water with them. Riders should know that hunters use the trails in the deer season. There is no horse camping on the Brule River State Forest, but private campgrounds in the area do accommodate horse campers. Some people call the Brule River "the river of president", although it also attracts senators and millionaires. The Bois Brule has a pedigree above any river in Wisconsin and possibly any river east of the Mississippi. The Bois Brule River in Northern Wisconsin doesn't lack anything. It has quiet-water, riffles, beautiful wild scenery, rapids, whitewater, and world class fishing.1- To go there: Brule is about half an hour east of Superior on U.S.2. 2- Paddling: it will take from 5 to 6 hours to paddle from Stones Bridge to Brule. Two persons can rent a canoe for $48 or two kayaks for $60 on weekends. You also can go for kayaks, especially when water is low. It will take three hours or less for the eight-mile trip from Highway 13 to Lake Superio. You can rent from Brule river canoe rental, but it's preferred to make reservations for weekends. 3- Camping: There are two Brule river state forest campgrounds on the river. They are the Bios Brule just south of the town of Brule and Copper Range four miles north of town, near the Pine Tree Landing. 4- Accommodations: we have a beautiful cabin situated inbetween the Big Brule and the little Brule river within walking distance to the town of Brule available upon request 715-817-0557. There are three major sections of the Bois Brule River. The first section from County Road S to Highway 2 is a very popular day trip with canoe outfitters in the area to support you with rentals and shuttle rides. This is a very simple section with its quiet water and a few riffles and rapids. You have to be sure before doing any of these sections to call for water levels 715-372-4866. There is a great thing about this river that is thanks to the many wetlands in the area where the water level is generally always adequate for paddling. The second section starts at Highway 2 and ends at Highway 13. The beginning of this section is picturesque and relatively calm, after Pine Tree Landing there are a few challenging rapids and two famous ledges, Lenroot and May’s. About half way through this stretch is the Copper Range Campground and Landing. That is the nice place to camp and fish and have a picnic lunch. There are great fishing areas along this river so be on the lookout after every turn for fishermen and give them plenty of room. The final section is from Highway 13 to Lake Superior. This section has easy rapids but slows down and widens the closer you get to Lake Superior. It was very ominous the last time we did this section. There was a storm rolling across Lake Superior with black clouds fast approaching. We paddled hard and pulled out just in time to watch the storm from our car. This stretch is not as popular as the others, but to paddle out directly into Lake Superior is experience onto its own.